Sand Castle is the perfect choice for a beach vacation. It’s open-air design brings the sea, sand and sun right to your doorstep. Lorient bay is perfect for surfing (the local surfclub is close by) and paddle boarding or kayaking. There’s one small room without a bathroom in the main house with a twin bed and trundle which is perfect for kids. Beachfront villa near shops and restaurants! Sand Castle sits directly on Lorient Beach in the heart of the island. 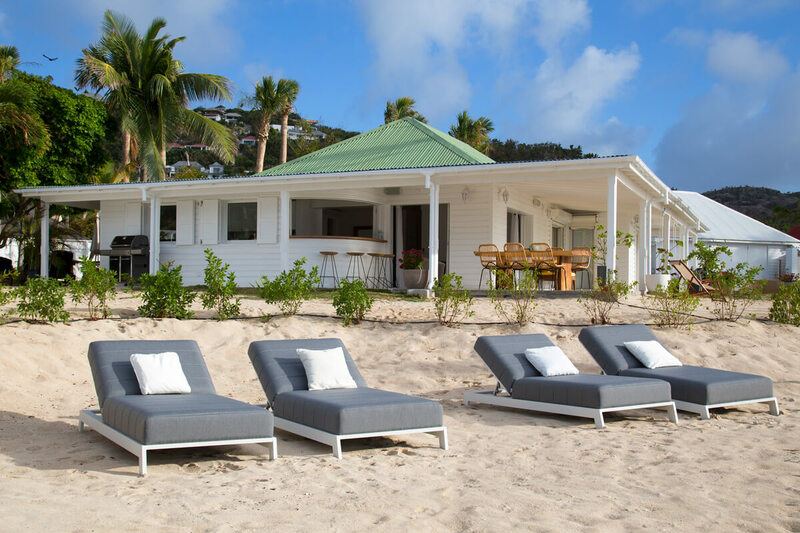 This three-bedroom (plus 1 small room for kids) property is ideal for travelers who want to relax by the sea and explore St. Barts. Plush lounge chairs sit on the sand between two palm trees, and al fresco dining is on the terrace a few steps away. The terrace has been designed as the ultimate outdoor living space with a curved breakfast bar, a barbecue grill, and direct access to the villa’s interior. The spacious indoor living room has oversized furnishings and two walls of sliding glass doors that open to the beach. Terra-cotta tiled floors, a creamy color scheme, and the use of natural wood ensures total relaxation. The living room’s entertainment system lets guests enjoy movie night without sacrificing the sea breezes or scenery. Nearby, the open-air kitchen’s curved countertops face the glistening sea and provide plenty of space for cooking. The wine fridge, deep sink, and standard appliances make it easy to prepare any meal. Sand Castle’s three bedrooms also have an open-air feeling. The master suite has a king bed and an ensuite bathroom with an ocean terrace, and the queen suite has an ensuite bathroom with a garden terrace. The kids room sits at the end of the hallway in the main house. The fourth bedroom with a queen bed is accessed from outside near the parking area. A housekeeper visits Sand Castle daily, except for Sundays and holidays. Lorient Beach is active yet peaceful with fishing boats rocking on their anchors, and there’s a bakery and shops nearby if you need a break from the sun. Upon arrival guests are met at the airport by a member of the villa management team. After the guests secure their rental car, they will follow them back to the villa for an orientation of the property.